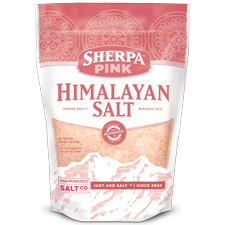 Best-selling grain size, Sherpa Pink® Extra-Fine Grain Himalayan Salt, is perfect for finishing your favorite dish or snack. The grain sizes provide a perfect blast of flavor without overpowering the palate. Himalayan salt is a mineral dense, naturally harvested salt known to contain many trace minerals. The extra-fine grain size is a wonderful replacement for standard table salt.